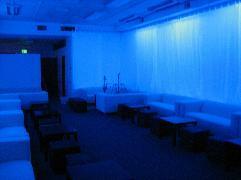 ICE Hookah Lounge is the first of its kind. At ICE, all hookahs come prepared with ice mixed in the base for the coolest and smoothest smoking experience possible. Unlike many other hookah lounges, ICE offers specialty hookahs prepared with unique mixes of shisha combined with fruit juices mixed in the hookah base. This provides the best tasting hookah experience available. For those who enjoy smoking out of multi-hose hookahs, ICE offers three different hookah pipes to choose from, including Rotating Single and Double Hose Hookahs, as well as a 35" Quadruple Hose Hookah. For those in need of a drink, ICE offers a wide selection of bottles and cocktails. My friends and I decided to go up to Towson to check out this Hookah Bar. We went and put our name down (because it was crowded) and waited, and waited, and waited. Took us 3 hours to get a table for 3 people. They didn't serve alcohol like their posting says, you have to go around the corner and 2 blocks to the local liquor store and bring your own drinks. I would say this isn't so bad, but when it's crowded the service is slow, waited 15 mins for the girl to come back to the front and flag her down to get a new coal.